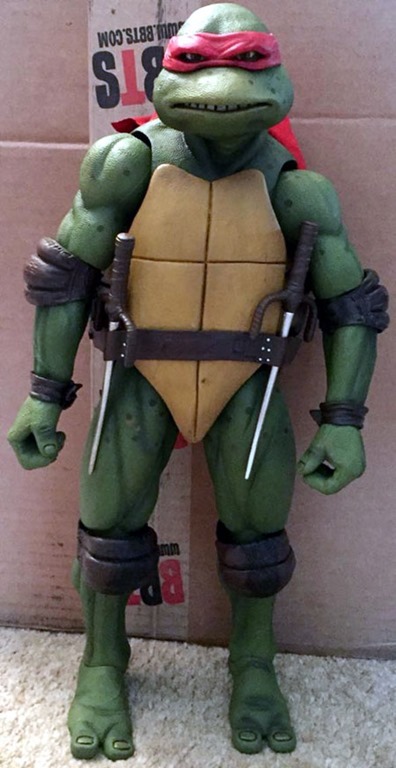 Right about a year ago, back in early February 2018, I had decided that I was going to “give in” and actually spend the money to get one of the NECA 1/4 scale TMNT figures based on the 1990 film. Then the company I was working for decided that due to “lack of business” I was “expendable” and laid me off, so I put the big, singular purchasing on hold. Reemployed for some time now, I decided to give it another shot, and managed to successfully order the Raphael figure, as my favorite of the turtles in that movie! 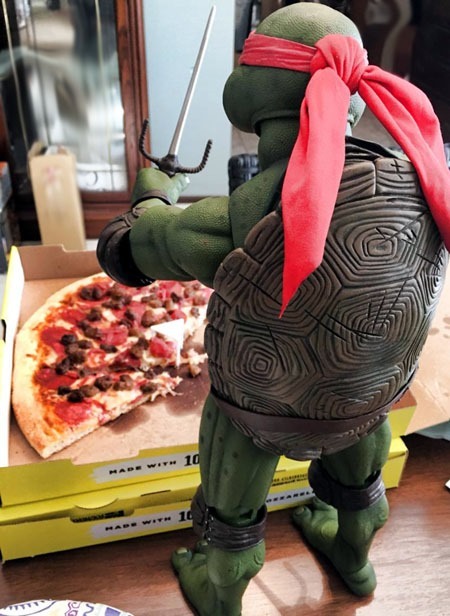 The box is huge…I remembered these being large, having seen the Leonardo in a store in late 2017, and the Trenchcoat Raph at a convention last spring. But after so much time, I’d forgotten just how large it was…despite knowing the figure itself is quite a size! 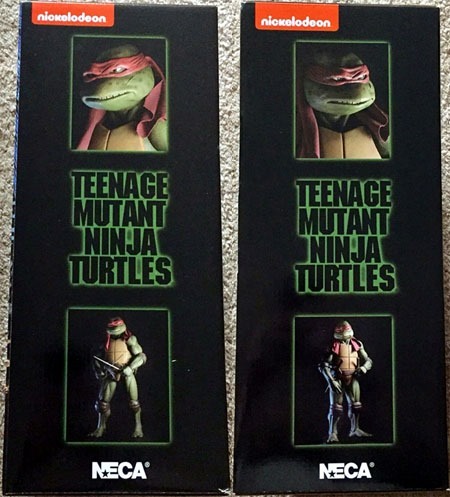 The sides of the box both show a closeup of Raph’s face as well as a full-body shot. 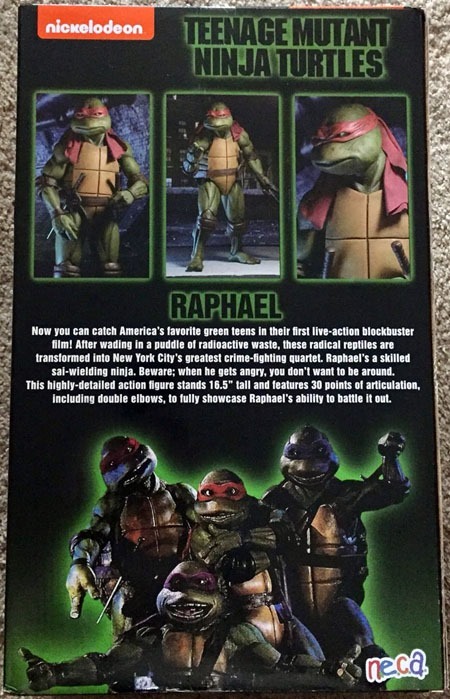 The back shows several images of Raph, as well as a group shot of all four turtles, and a brief blurb about the figure. Here’s the figure out of its packaging. As I opened it, I caught myself thinking about how some figures anymore, I may hesitate to take out of the packaging; whereas this one, I opened the mailing box and basically kept right on going to get the figure itself out–no hesitation or thought of leaving it in the box for display or such! My intent for getting the figure was/is to have it “loose” and displayable! And here’s the figure from the back. I don’t know WHAT it is about it, but I absolutely love the detail in the shell! I’ve always dug the shells for the movie turtles, and at this size, the detail is incredible! 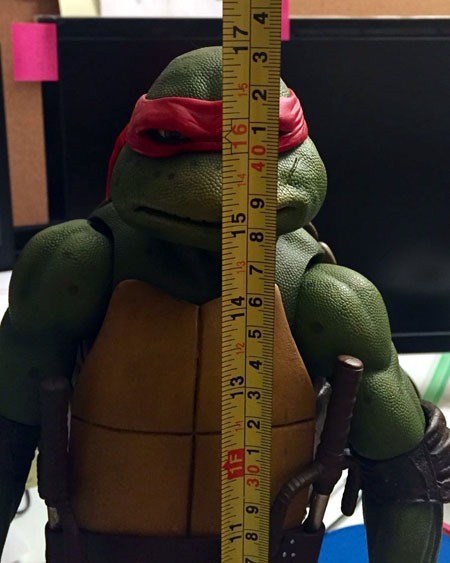 Though the box and marketing suggests the figure as 16.5″ he seems to be closer to the 17″ mark. Some of that may be the angles–as you can do some amazing stuff with size and angles. But while the technical specification might be 16.5″ I’m comfortable considering this a 17″ figure! The figure arrived on Friday the 8th; and with virtually any given day of the year being some sort of made-up “holiday” or such, Saturday the 9th was some sort of “PIzza Day.” We had some work being done on the house, and took advantage of a “Pizza Day” sale from Hungry Howie’s for everyone. I couldn’t resist taking a photo like this, as the figure was already standing on the table the pizza was on! 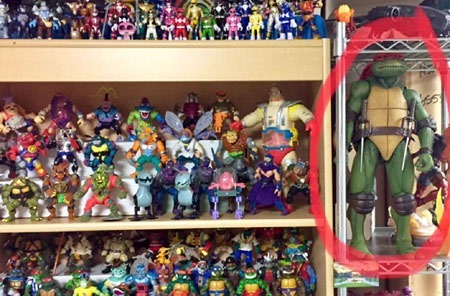 And for immediate scale, here’s the Raphael in a temporary spot near my “regular figures” display shelves…you could put a figure on Krang’s Android Body‘s shoulders and it still would not be quite as tall! While the size of this figure is getting a bit “normalized” to me after seeing it as I have now…initially getting and opening it really impressed me! And speaking of being impressed…I’m really extremely impressed with the detail of this thing. Compared to other figures purportedly based on the film, this seems like something out of Last Action Hero like someone reached into a screen and pulled the actual character out, frozen in a fraction of a moment of time! Against bare wall backgrounds or mailing boxes or shelves with other figures, this is obviously “just” a large figure. But the detailing/style is such that with a darker background, by itself and nothing particularly distinguishing in the background for its actual scale…one could really take this and create/recreate lifelike images to rival the original 1990 film! In fact, nowadays, it seems to me that it’s hard to simply “google” the film and not have to guess at thumbnails–is it a promotional image from nearly 30 years ago, or a well-staged photo of one of these figures? I honestly cannot even imagine a better figure, short of some sort of just-as-sturdy rubbery texture and a malleability to the material it’s built from! And the figure itself is heavy–the packaging was thin tagboard for the box, just enough plastic inside to hold the figure and accessories; but my shipping notice suggested the entire package was around 8 pounds! I told myself that if I was just getting one, I was going to get Raphael. I’m very interested in the others, and there’s a Shredder coming later this year, I believe! A lot of what I tend to buy–toys, comics, whatever–tend to be fairly “immediate-gratification” and “impulse” buys. A lot that I consider getting, if I don’t get it right away tends to go “out of sight, out of mind” overall. This one, though, has been at least in the back of my mind for over a year, and certainly one of my most-anticipated “frivolous” purchases ever. AND despite having that year-plus to build up expectations and such..I can honestly say that I REALLY like the figure and am NOT disappointed in my purchase nor the figure itself! My only real reservation regarding the figure is stories I’ve read online about the figures (eventually) keeling over and doing damaging shelf-dives; and have confirmed for myself that once a decent bit of pressure is applied to pushe the figure forward, it will pretty easily tip. So I’m going to be looking for some sort of stand or such to hopefully shore up the figure’s long-term stability without sacrificing it’s amazing appearance. 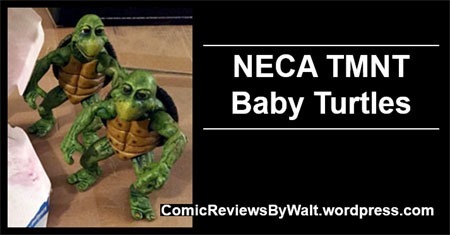 For over a year, I’ve been interested in the NECA figures based around the 1990 Teenage Mutant Ninja Turtles film. I was about to "pull the trigger" on buying one last year when I was laid off outta nowhere, and so that was firmly put on hold. Now, re-employed for some time, I turned my sights back toward the figures, loving their detail and accuracy to the film in a way that other "based on the 1990 film" figures never seemed to truly match. 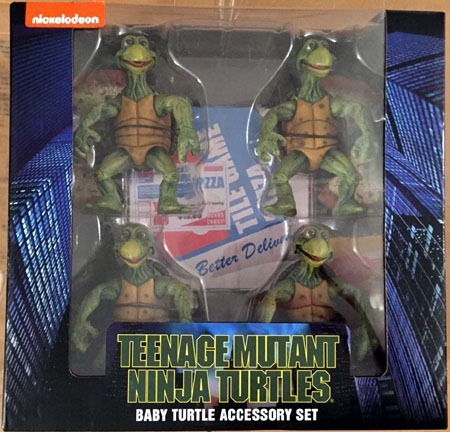 I decided to start with the TMNT Baby Turtle Accessory Set. Though they were really only in the film for a brief scene–probably not even a full minute–I liked the look of these figures, as well as the price. They’re a bit more expensive than 4 standard TMNT action figures, though they’re basically the same size. 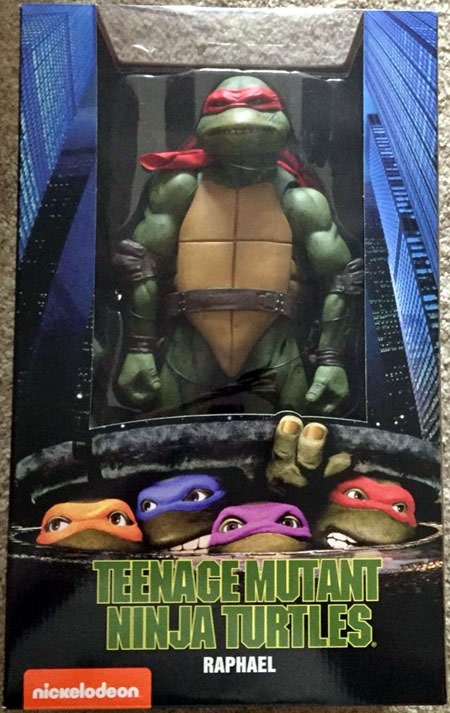 As "premium" figures go, that’s not a bad price…and all the more compared to the "full size" teenage turtles. 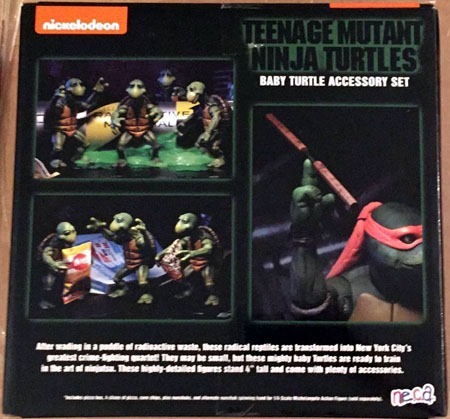 The set comes with the four turtles, as well as a Domino’s pizza box, a bag of chips, several baby-turtle-sized slices of pizza…and apparently to make up for some deficiency in size/etc or to otherwise add some sort of appeal to the pack, a "bonus" hand for the full-size teenage Michelangelo from his show-off-duel with a Foot ninja in the film, spinning his weapon balanced on the tip of a finger. I love the detail of the pizza box–it’s a flimsy tagboard sorta thing, but looks like a real pizza box miniaturized down to the grease stains! The pizza slices are a rigid plastic, so a bit off-balanced if put in the box. But they’re decent for having the turtles hold. The bag of chips is another nice touch, another "snack" and piece to add scale to these turtles. "The little ones were crawling into a strange, glowing ooze from a broken cannister nearby. I gathered them up in an old coffee can, and when I awoke the next morning, I received a shock–for they had doubled in size. I, too, was growing…particularly in intellect. And I was amazed at how intelligent they seemed, but nothing could have prepared me for what happened next: one of them spoke. "More words followed, and I began their training, teaching them all that I had learned from my master […] And soon, I gave them all names. 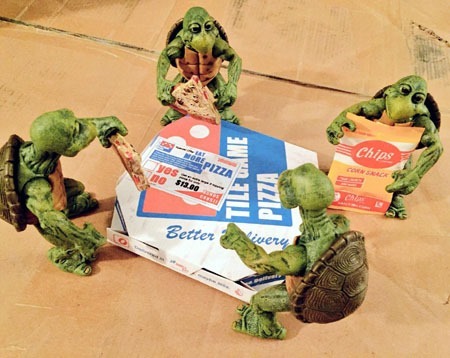 Leonardo, Michelangelo, Donatello…and Raphael. 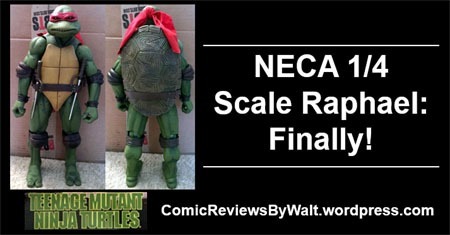 So next up for me is the full-size turtles and possibly the Shredder. At minimum, I definitely want to get Raphael and Leonardo, and Shredder. Of course, I’d love to get the entire set, but these things being expensive and going "out of production" (aka "out of print") and such could put a huge spanner in the works on that idea. For their steep, premium pricing, though…it’ll be a longer journey, as I may be willing to sink the money over time, but not in a large, lump sum, for multiple items in the line. 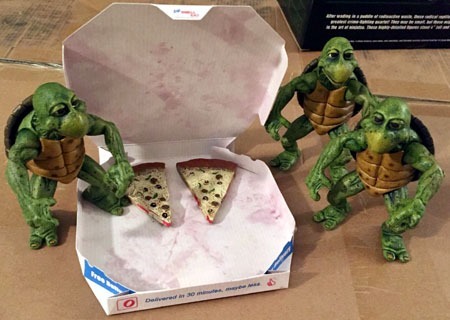 Along with these baby turtles, and the full size turtles, and a Raphael-in-trenchcoat, I believe there’s a Foot ninja, and coming sometime "soon" (or so I’d swear I’ve read) is Shredder. Then there’s a reproduction of Casey’s facemask, as well as a replica of the ooze cannister. 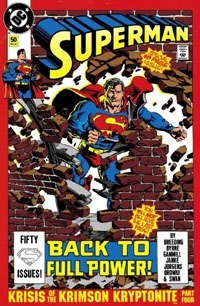 Speaking of covers and cover prices…this may not be THE best or THE most iconic cover ever for a Superman comic (at least, not to me, and not one of my personal top ten) but its "spirit" is pretty iconic–Superman bursting through a wall. In this case, fairly appropriate, after several issues of his being powerless…basically a normal human. Having the strength to simply, cheerfully burst through a solid brick wall is a small indicator of his power level being much increased. Superman #50 is one of the first comics I ever got as a "back issue," and before I really knew the concept of "multiple printings" or "variant covers" or the like. The copy of the issue that I first owned, the first time that I read this, gave away a fairly major spoiler for the issue (at the time). Historic Engagement Issue. Ok, so the engagement was looming, and it happened here. I had no idea at the time that it was a second print, hence spoiling the ending by calling out what happens in the issue and how it’d go down in history (beyond concluding a several-part story and seeing Superman get his powers back). This issue gives us a glimpse of Clark in action, going about life powerless–but getting beyond the simplistic "mild-mannered reporter" and letting us see that it really is he himself–Clark–that makes the man, not the Super. Even without powers, he’s not gonna stand by or put his own safety first…he helps people, and tries to step in as able. He checks in on things with Lois, who has just gotten her father’s approval in dating Clark. Jimmy’s mother is doing better…even as we see that Perry and Alice are having their own issues, still reeling from the death of Jerry. And of course, Luthor being Luthor. When Lex contacts Lois, Clark steps in, demanding an interview…which he’s granted. Luthor’s convinced to tell how he’s deprived Superman of his powers…and since he’s telling some reporter, he’s not breaking Mxyzptlk’s One Rule to Not Tell Superman. 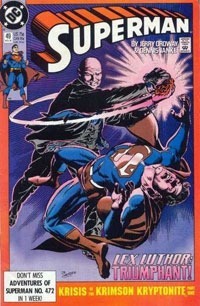 Of course, Luthor has long since discarded the notion of Clark and Superman being one and the same…but that doesn’t change that Clark is Superman, and Mxy’s powers are magic based and thus bind the rule even without Mxy’s conscious direction, so Luthor telling Clark means he’s broken the rule…and Superman is re-powered. The imp shows up, gives Superman a freebie of sorts (providing a Rule to the game and how Superman can send him away, and then getting Superman to fulfill it) and actually leaving. Luthor’s great victory is wiped away, and the man is dying. Meanwhile, Lois has thought about Clark’s earlier proposal…and says yes. She WILL marry him. While I did not read this in my initial time into comics, it was still one I read relatively early-on, prior to The Death of Superman. It was cool to see the actual engagement, as well as to have another chapter of the story with the red-border covers, which helped "place" this time-wise/continuity-wise for me at the time. Now, re-reading this, it’s actually sort of hard to believe, and seems such a long time ago, in Clark and Lois ONLY here just getting ENGAGED. Though the engagement aspect went on for a number of years–over 60 issues–they’ve been married so long that I find it natural and preferable, and this was the kick-off, if you will, of that long-lasting aspect of the characters. Story-wise, this is definitely "classic" Superman for me, for my favorite version of the character, during my favorite period of the continuity. This came at the beginning, served as part of my "foundation" in Superman stuff, as a Superman fan, witnessing the actual development and forward-movement of the character and supporting cast. I think part of that also came from (and I’m using modern thoughts to "project" on my past self) feeling like there was room for surprise and growth beyond done-in-one issues and self-contained every-story-must-stand-alone-and-be-a-graphic-novel-in-serialized-form comics. Clark is the character, Superman is what he does, how he presents to the world when he’s in action. We see his relationship here with Lois–not one of hero worship on her part, or some single-minded buffoon or mere story-trope–but as real humans. She is interested in Clark–the person–and not chasing after some guy in a cape. She wants to marry Clark, and has no idea that he IS Superman. He’s just a man she’s friends with, has come to know and love, and it’s genuine. This being an expanded, extra-sized issue is definitely a good thing, allowing nearly double the usual length, and thus a lot more story in a single issue…and though the engagement happens here, it’s organic, a rather small part of the overall issue, and is far from actually being the FOCUS of the issue, story-wise. It’s just a darned good Superman comic, at least to me and in recognizing the nostalgia for me. Visually, it’s an interesting issue, with numerous artist contributing. On one hand, I’d figure that’s partly to allow an extra-sized issue to be produced in the same amount of time as a regular-sized issue while holding to schedules and avoiding fill-ins. It also allows more artists to be part of a key issue in Superman’s history. That said, while I vaguely noticed some unevenness in the art, I was much more engaged (no pun intended) with the story itself, and it wasn’t until sitting down to type up this post that I consciously noted (re-realized) that there were so many artists involved. The art all worked together and was not jarring to me in style or otherwise (perhaps thanks to the single colorist). For an anniversary issue without drastically different variant covers or such, I absolutely welcome the "jam" nature, with a lot of artists "being part of it," and will gladly overlook the uneven nature of that. All the better when the art works with the story and doesn’t distract me. All in all, this is definitely one of the more "iconic" ISSUES for me, and a key issue in the history of the character. Despite that, I’ve found it in a number of bargain bins over the years; the copy I actually read for this revisiting is from a 25-cent bin…in which there were multiple copies, both of this first print and the later print, and I even convinced a friend to get one to read. Definitely an issue worth reading and having, even out of context and without the entire Krisis of the Krimson Kryptonite story. As a conclusion, it’s fitting, and makes for a good end to that while moving the overall Superman mythos forward and opening stuff to coming stories. Krisis of the Krimson Kryptonite Part Three: Breakout! I was a little bit correct and a little bit off in my assessment of Starman #28‘s place in this story…as reading this would definitely feel like something HAD been missed if that wasn’t read first. Yet, there’s context and footnote to explain the high-level "essential" stuff so you get what you "need" from this. Roger Stern was the writer on that, and is on this, so there’s some definite organic tie-in stuff, with the necessary retread for this era in which comics were not designed and destined for a "graphic novel" or collected edition. We get a bit of that essential retread to start this issue, "Superman" confronting Luthor and getting the Red Kryptonite from him. We then move to Superman himself and Hamilton as they test out a suit of armor and things don’t go as well as either of them would like. Starman tries to be helpful, but is unable to cheer Superman at all. Meanwhile, Killgrave (a mad scientist/mad genius) launches his plan to bait Superman, take out the hero, and escape. Starman does super feats while Clark goes about life. 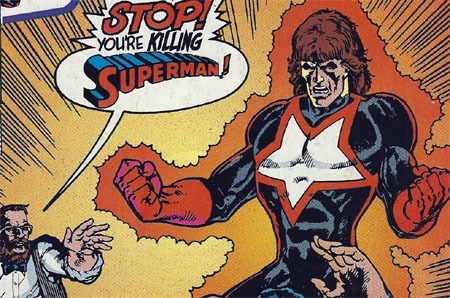 When Killgrave springs his trap, Starman takes him on as Superman, to shocking effect before the real Superman shows up in his armor. Facing Killgrave, our hero gets lucky with a failsafe in the armor allowing him to bluff the villain. 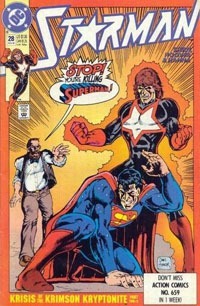 Killgrave attempts to escape, and the powerless Superman leaps back into action to attempt to stop him…but fails, and Starman has to save Superman rather than pursue the fleeing villain…which bums Superman out all the more. Mixed in there, Mxyzptlk uses Red-K dust in Luthor’s office to reveal that the Superman flying around is an imposter, which cheers Luthor a fair bit. 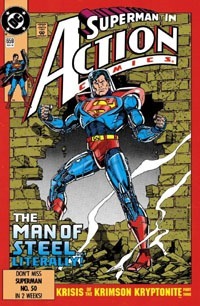 I enjoyed reading this issue…it originally came out toward the end of my first "run" with comics, when I was still getting to know this version of Superman and was really too young to "get" a lot of it, where I appreciate stuff a lot more now as an adult. This definitely reads as a middle chapter, but does so in a good way…fleshing out the notion of a Superman without powers trying to find a way to "stay in the game" while conveying the danger and frustration he faces. It also touches on subplot stuff to remind us of the larger tapestry of the Superman saga and keeps things grounded and interesting. As a middle chapter, though, there’s only so much this can do, though it’s interesting to have Superman try the armor and lose it in the same issue. With contemporary standards getting, having, and using the armor would be a several issue thing in itself, with loads of variant covers and hype over the "new costume" for him and numerous artists’ interpretations of it and so on. The art is quite good and very much to my liking. Though the story is good, I do think the quality art lent itself significantly to my simple enjoyment of this issue. All in all, another good chapter of this arc, and another issue I’d recommend if you find it in a bargain bin. 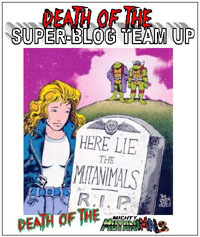 Krisis of the Krimson Kryptonite Part Two/A: The End of a Legend? I honestly miss THIS kind of crossover/tie-in. Granted, we’re talking over 26 years separating this from being new, but having a random one-issue tie-in to a multi-issue thing in another family of books with a shared creator seems a long-lost thing in many ways. Granted, there’s a slight bit of return to that more recently, especially in the case of DC, but even stuff like Superman: Reborn doesn’t quite have the same feel that this sort of issue did and does. Starman arrives in Metropolis, and after "wow"ing some citizens who happened to be looking up in the sky, finds his way to Professor Hamilton’s place, where he’s greeted by the professor. Superman soon arrives–much to Starman’s surprise–as he arrives via freight elevator rather than flying in using his own powers. Superman relates to him what’s been going on, and enlists his help. It seems Starman was able to re-charge Superman and his powers once before, so it stands to reason perhaps he’d be able to do so again. Along with some special equipment Hamilton rigs up, the heroes get down to business…though unfortunately, they’re met with failure. A couple other ideas come out, including Starman standing in briefly for Superman, able to pull off appearances to convince the populace–and specifically Luthor himself–that Superman has NOT actually lost his powers. However, Superman is determined to get back into action one way or another, as he can’t just count on Starman as some full-time/permanent stand-in. Meanwhile, Starman subplots are present, but don’t detract from the reading experience, coming into this on the Superman story. I don’t know the non-Starman/non-Superman-related characters in this book, but that doesn’t take away from my enjoyment of this issue. I read this specifically because of being a tie-in to Krisis of the Krimson Kryptonite, crossing the Superman family of titles. I associate Roger Stern with his Superman work, and "assume" it was his also working on this book that brought it into the story, as he could easily work things together. And, at this point in the early-’90s, there seemed to be a lot more room for random character crossovers without it being some huge deal. I don’t need (nor for the moment particularly WANT) much focusing on Starman’s supporting cast…I want (and got) an issue of him dealing with the Superman-centric stuff…and yet, with the snippets dealing with the rest of his supporting cast, one can tell that Starman is, himself, not a Superman supporting cast member, and that he’s got his own separate existence apart from meeting up with Superman here. It’s also a shame to consider a character like this is now so far removed time-wise as to functionally not even need to have existed as far as contemporary characters/stories go. While this feels like an extension of the story (and rightfully so!) it also feels like its own thing. The story seems like an organic stretch, with the two heroes aware of each other, having interacted in the past and all that, so of course Superman would reach out to another ally, even if it’s not someone he interacts with as regularly as say, Lois or Jimmy. This does not feel like a "forced" or "token" crossover, but one that is driven by story rather than agenda or sales (though I doubt there’d have been much concern with probably boosting Starman with a key Superman tie-in). Visually, this isn’t bad. I like the art overall, though at times Superman at least felt a little "off," with some nuances separating this from the previous couple of chapters of the story…further marking this as its own thing. I like the cover…the red and orange makes it both distinctive and yet fits well with the rest of the arc. It’s also very attention-grabbing in the imagery, playing off classic silver/bronze age stuff. Hamilton runs toward a Starman standing over a struggling Superman exclaiming that he needs to stop–he’s killing Superman. Of course, as we find actually reading the issue, the scene is contextualized with Starman using his power to try to recharge Superman, with Superman trying to tough it out until Hamilton calls things to an end. I’m pretty sure this is not ESSENTIAL to the Krisis of the Krimson Kryptonite story, but it sure fits, and for the cover alone came off as something I very definitely wanted to have, to read as part of the story. The chapter numbering–Two/A–puts me in mind a bit of the Supergirl and Aquaman tie-ins to the 1998 Millennium Giants story that ended the Electric Superman year. If you can get this issue along with the Superman ones, I definitely recommend it. And despite not having read this story as a whole (or mostly whole) in quite a number of years, I continue to enjoy it, and have actually had to hold myself back slightly from just flying through the reading, as I take time to write up each chapter after it’s read, before going on to the next. Krisis of the Krimson Kryptonite Part Two: Clark Kent–Man of Steel! This is another very nostalgic issue for me…from the cover on in! We open on Superman hanging upside-down, tangled in a rope, while a hulking behemoth–Mammoth–postures about being the one to take him out. Flashback to the day’s start–a visit with Emil Hamilton as well as (separately) Lois and her family, where Clark learned that they’re indebted to Lex Luthor for Mrs. Lane’s survival. In the present, Superman bluffs his way out of being squished by Mammoth, and barely survives the SCU’s attempt to take the villain down…which leaves Superman to play a harrowing game of "chicken" with the rampaging brute–essentially staring him down without powers. After making his way home and reflecting on the day, Clark realizes his days as a hero may be done, unless he can get some help…and places a phone call. While I’d read a handful of issues prior–and this issue itself is some 20 issues after my first of the title–this is still one of my "earliest" Superman comics that I owned, in my "initial run" with comics. And though I didn’t know it at the time, this is largely by one of my all-time favorite creators–Dan Jurgens! It’s reasonable for me to assume that this early issue was quite influential–as well as other issues he was on–in both setting him as one of my favorites, and "imprinting" his take on the character as a sort of "default" or such in my mind. That said, nostalgia certainly swings my opinion of the visuals very much into the positive…though I’d say they’re quite good anyway. It’s not hard to follow the story, everyone looks recognizable…and something TO the art, I felt like I could SEE Superman’s physical vulnerability here. Sure, he’s in-costume, but I "bought" that he’s powerless. The story is very solid as well, advancing the overall story of this arc while functioning nicely as its own issue…complete with a fairly obvious (to me) formulaic structures (starting on action, flashing back to earlier, catching up to present and resolving that initial high point, then giving us a bit of drama to end on). We get to see Clark as himself and as Superman; we have a villain; we have interaction and story advancement of supporting characters/subplots. 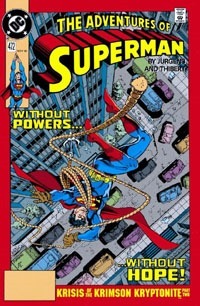 Superman literally in a bind against a villain, surviving, and ready for whatever the next step of his adventure is. All those years ago, this was the sole issue of the story that I had and read: I came in on Chapter 2, never having read the first chapter, nor getting to read the latter chapters until some time after the fact; in their initial run, I didn’t even know about the "event" within the "event" that ended this arc until some time much later. And I was not put off by getting an isolated chapter of a larger story. As such…this is a good issue as a random one-off: there’s plenty of "continuity" that it draws from and sets up, and the ending hints at stuff to come, and we have no resolution to Superman’s powers, but we still get a story in this issue. It’s a "middle chapter" without feeling like it’s wholly incomplete, unlike many contemporary comics. 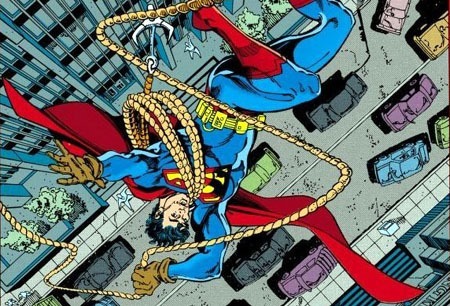 The only "complaint" I’d have is that the cover is a BIT misleading–it pertains to the story within in that we see Superman in trouble with his rope-and-grapple gear, but not falling helplessly toward a street. Still, as covers go, it’s a great piece–eye-catching and conveys the "heart" of the situation–without being context-lessly generic, "iconic," or vague. Best of all, this IS the cover. It is THE cover. No variants, no collector’s editions, no enhanced editions. To my knowledge, it’s this issue, or the collected edition. I’d definitely recommend this as a simple, fun-ish read if you can snag it for under $1, and certainly worthwhile if you can snag the whole story! This issue grabbed me rather recently, going through bargain bins. The cover got me, with its distinctive red border/trade dress for this story. It both sets this issue apart from earlier issues, but the trade dress unites the entire Krisis of the Krimson Kryptonite story as a whole in a way that still calls it out for me nearly three decades later, one of its chapters being amongst my earliest-ever comics in my collection. The issue opens on Perry and Alice white at the grave of their son Jerry, who has recently died. We also get a bit of context, that Lex Luthor is the biological father. Luthor, too, laments the loss…and while he stands over the grave, he’s assaulted by an odd red rock…seems Mr. Mxyzptlk is due again, but is having too much fun where he is. 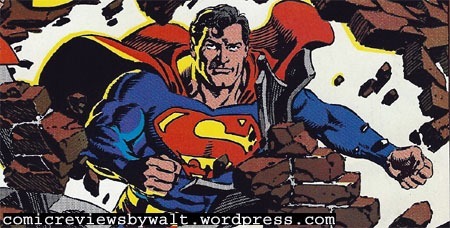 As such, and not wanting to let down his good buddy Superman, he figures he’ll kill two birds with one stone, letting his quarterly mischief manifest via the red rock–Red Kryptonite–to mess with Superman. Meanwhile, Lois and Clark are out and about when they bump into an old friend of Clark’s–Pete Ross from Smallville. The two friends catch up briefly, and Pete obtains Clark’s "blessing" to pursue Lana. Not long after, Luthor figures out how to get things moving with Mxy’s magic rock, as Superman saves the day from a villain named Barrage. As the magic goes into effect, instead of granting Luthor power to be equal to Superman…Superman’s powers are taken away…making Luthor equal to him. 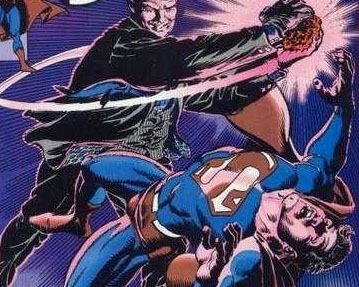 Magically summoned to Luthor’s presence, and still in shock at the loss of his powers, Luthor gives Superman quite a beating before having him thrown out. Back at home, despite not being up to the visit, Clark finds himself in position to be a rock himself, as Lois is going through a rough time. Though it was a number of years after I’d first read any part of this story that I got to read the rest of it (including this opening chapter), this brings back a lot of memory, of this era of the Super-titles. This issue has the very familiar visuals of Jerry Ordway that I’ll likely always associate with my earliest days reading Superman comics. The characters are all familiar and distinct and look quite good. The story itself is strong, as well–painting a picture of what’s going on in general at this point in the Super-titles without being overly-obvious about doing so. (I’m reading this story "out of context" but there’s enough to remind me of where things were continuity-wise at the point this story takes place). We’re introduced to the setting and characters, given some clues as to recent events even while we see current stuff unfold, and the driving conflict of the story–Superman losing his powers to a chunk of red rock–is set in motion. Rather than leave us on some cliffhanger proclaiming that his powers would be gone or such, we actually get that in this very issue, as well as immediate after-effects. In that regard, this issue probably has two or three issues’ content by modern standards, neglecting to be highly-decompressed or drag stuff out. The issue’s by no means some absolute stand-alone thing, but there’s enough, I think, that one could enjoy it on its own without having read much of this era previously, and the reader can figure out in general the current situation. That said…this works pretty well for me "jumping in" and not having to page through a bunch of issues to re-familiarize myself with the story. This was quite enjoyable in and of itself, even as I look forward to issues to come–including the sole chapter I read during my initial period being into comics. I’m definitely enjoying diving back into this era, however briefly…and while this issue by itself isn’t necessarily anything all that special, the story as a whole is, and if you can score it for around $1 an issue or less, I definitely recommend it, as of re-reading this issue alone.